The Grand Central Circuit gets its name from Grand Central Station because, like the subway system, it goes up and down, only into the sky rather than down underground. The roads in the sky provide tough elevation change with up to 15% inclines on a small loop which will make for some tough racing. Here’re a few of the great landmarks on this route. The route starts out at Tavern on the Green, a popular restaurant that’s been around since the 1930s, located in a prime location near the Southwest corner of Central Park. One thing has remained constant about this location is that it’s an iconic meeting point for local NYC cyclists. Simply telling another cyclist "Let's meet at Tavern" is all you have to do to schedule a ride with a friend, a group, or teammates, says Zwift Director of Events, Charlie Issendorf. In the early hours of the morning of the city that never sleeps, you can expect to see groups of cyclist gathering for some chatty laps of the park before the traffic gets too heavy. Zwift CEO, Eric Min, World Champ Mike McCarthy and NY Native, Charlie Issendorf, would meet here many years ago, back when leather helmets were a thing, before trying to rip each other's legs off in weekly criteriums and midweek hammer sessions. The Essex House is 1 of 260 members that make up the Historic Hotels of America that are identified by its authenticity, sense of place, and architectural integrity. 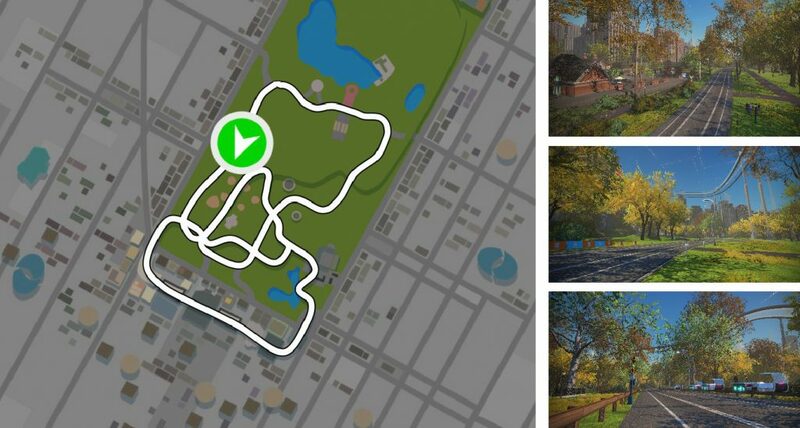 Being such a prominent landmark of NY and its proximity to the park we were always going to include it but not without adding our Zwift spin on it. You’ll be riding higher than the building itself at one point so you can get some of those sweet skyline views without cashing out for a penthouse suite. Balto Statue which has been in the park since December 1925. Balto was a Siberian Husky and sled dog that relayed medicine across 600 miles over arctic terrain to an Alaskan town to battle an outbreak of a deadly disease in January 1925. This incredible achievement is celebrated with the statue and is something all athletes can use as motivation to do incredible things. Having the statue in the game reminds us of his unbreakable spirit, and being dog lovers at Zwift, we’re not going to pass up an opportunity to feature our furry friends. Taking a horse and carriage ride through the Central Park is a classic activity, and tourists who want to re-live moments from films will jump at the opportunity to experience it. Funny thing is, it appears that the horses have a favorite place for their nature break, which happens to be on one of the roads where locals will race. In Zwift, this issue is a thing of the past, literally. Being New York 100 years in the future with rocket-horse-drawn carriages we’ll bypass the negatives so we can Ride On. The KOM Climb Reverse segment starts 1 mile into the route after an initial climb and a right turn onto the Reverse KOM Arch road. This Sprint segment flys by the Tavern on the Green and looks easy by the numbers, but there's more to it. Before the segment is a short climb. The trick here is to watch your effort over the climb and carry as much momentum into the sprint segment.